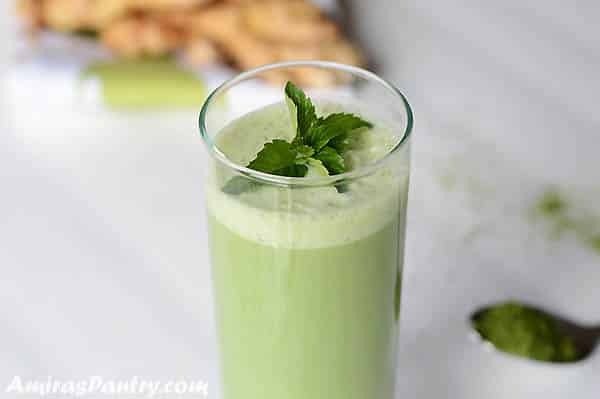 Earthy, sweet, spicy and creamy smoothie.A matcha ginger green tea smoothie recipe that tastes good, I would even go so far as to say it tastes great. 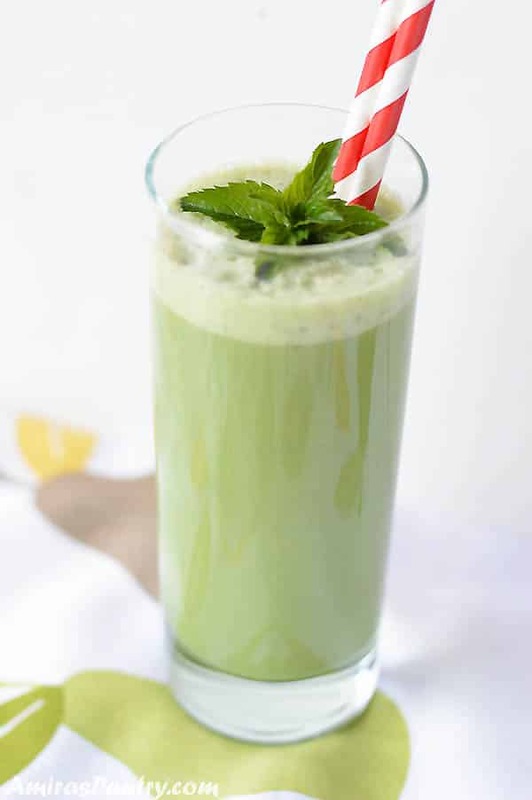 This matcha green tea smoothie will completely change your breakfast way. You guys, I am on a matcha KICK. And when I say kick, I mean I’m in this phase where I’m trying as hard as I can to incorporate matcha in our diet and convince my small family of consuming it. There is that thing about matcha that makes it really unusual and sort of amazing. 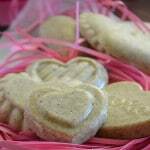 May be the color or the smell or may be the goodness that comes with it, and makes any recipe vibrant and healthy. 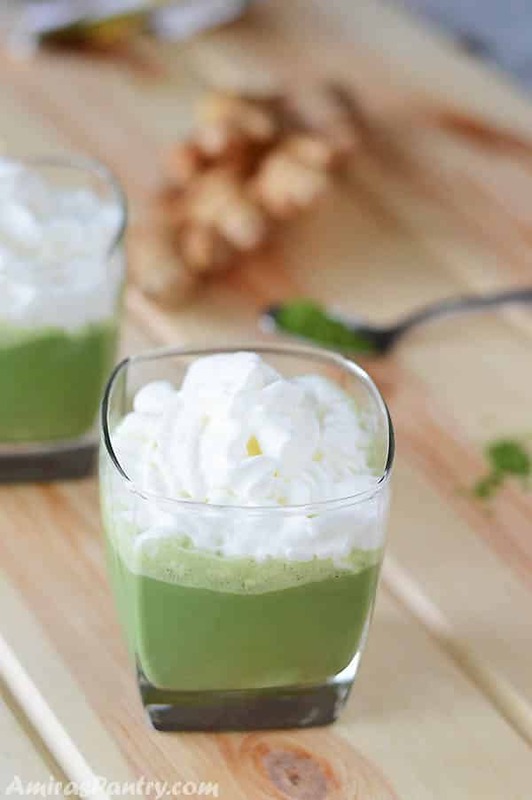 I’m not claiming that this recipe is a 100% healthy, but it has two ingredients , no actually three, that I could not include them in a recipe that my kids will actually like, ginger, matcha and cashew milk. I have to say that this recipe tastes amazing. If I can get my kids to drink a smoothie, like it and even ask for seconds, you know that it’s got to taste pretty darn good. 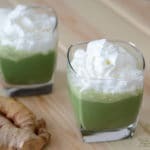 I’ve never been a fan of smoothies, but I have a kid who is obsessed with Starbucks smoothies, but the idea actually came when a ginger syrup recipe popped up while I was on pinterest. I really admire this genius idea, it is tasty, spicy and goes very well with many things. 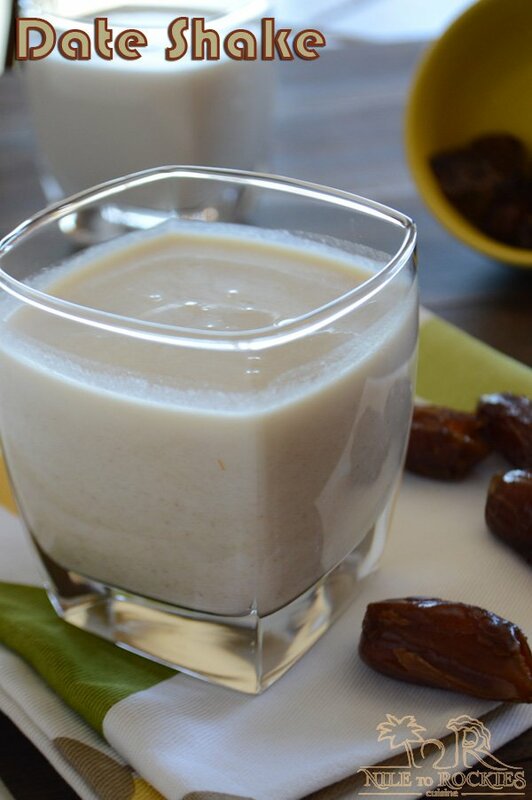 I’ve used cashew milk, which I find creamy and delicious, also used a couple of scoops of vanilla frozen yogurt, you can use dairy free products or use milk products, works both ways, adapt it to your preference and I am sure you’ll not regret it. 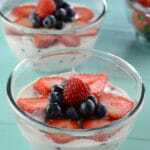 Besides the health benefits in this smoothie, it is delicious, creamy, kid friendly and even nice to look at  . 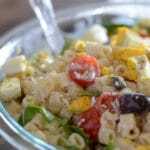 Make it for your breakfast, lunch or maybe for a cozy Sunday evening, the important thing is to … Enjoy. See you on the next recipe… until then enjoy your days. 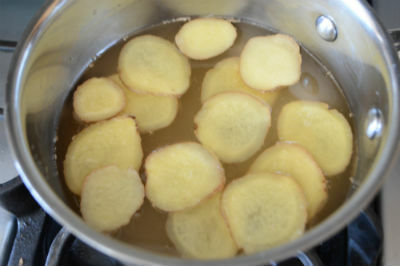 1/2 cup diced ginger rings. I did not peel the ginger for an intense flavor. 2 scoops of frozen yogurt. 4 or more fresh mint leaves. 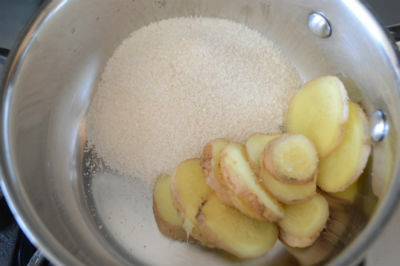 Start by making the syrup, in a pot over medium high heat combine water, ginger and sugar and bring to a boil. Reduce heat to low and let it simmer for about 20-30 minutes unthink thick. Strain the syrup and let it cool down. In your blender or food processor combine all the smoothie ingredients. Blend until smooth then pour into chilled glasses. Need more drinks? check out the drinks section. 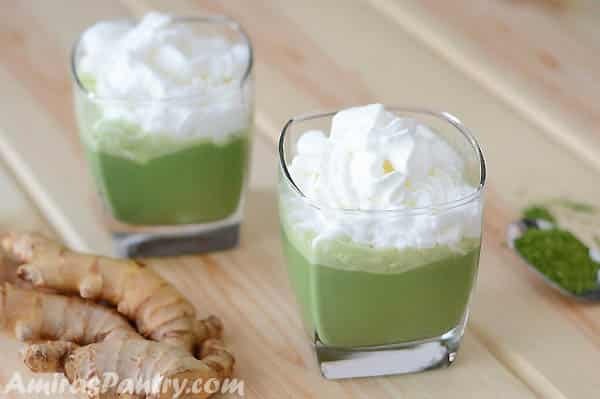 Love this wonderful drink and so many flavors I love all combined together, I am a huge ginger and matcha fan. 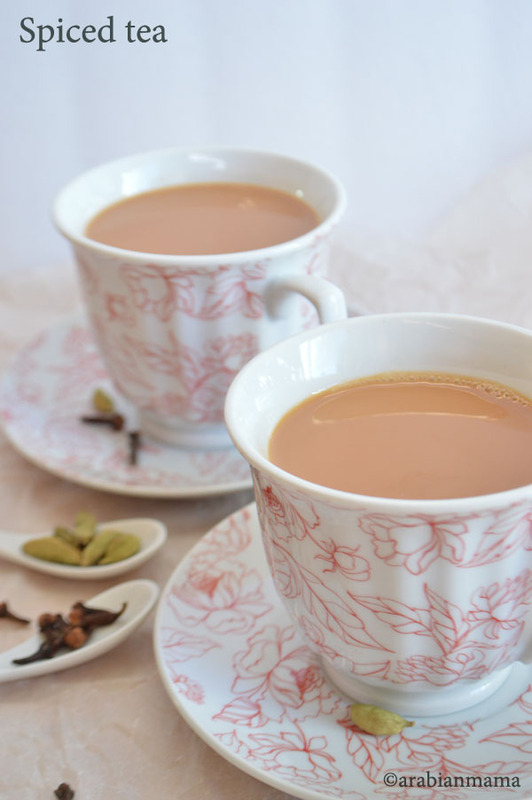 I also want to try your Middle Eastern tea as that looks lovely as well. Wishing you a super day. Alternately, Amira, check the recipe, you’ve lost the water on the ginger syrup. Instead of using the sugar in the ginger syrup,, start with a quarter inch slice of fresh ginger that you cut into strips, then throw in the blender with the other ingredients and a teaspoon of wildflower honey, as local to your home in zip code as possible or the raw cane sugar blocks from S. America, at least 2 shavungs from the caramel like block of full vitamin/mineral ful sugar…to taste. Or use half a pitted date, also chopped and added to blender with full slice of ginger until taste is sweet, peppery and tannic from the matcha. Thanks Jacqueline for spotting this error. You have such a wonderful and healthy alternatives, thanks for sharing them with us. In fact this was my first time making the amazingly delicious syrup so I wanted to kind of follow it to the T, I thought of making it with stevia instead, may be next time :). 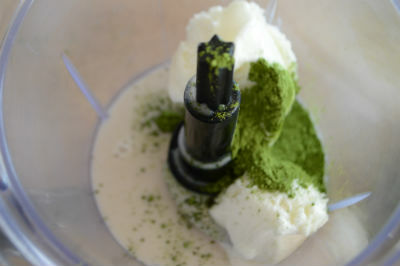 Yum, this is the second matcha tea recipe I’ve seen, including matcha tea ice cream. Is that whipped cream on top of the smoothie? If so, I’m ready to slurp it down (even without the whipped cream)!